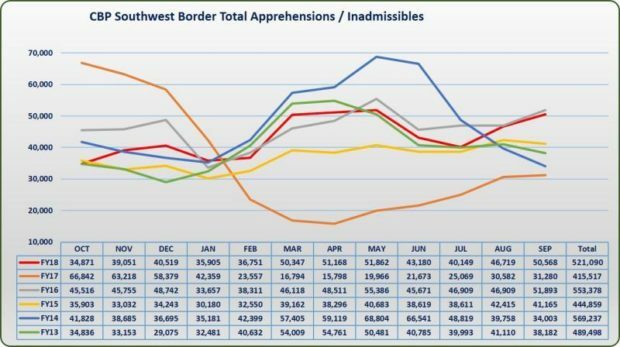 More than a half million people tried to cross the nation’s southwest border without authorization in fiscal year 2018, an increase of about 100,000 over the previous year’s total that was spurred by a surge in family migration from Central America. A total of 521,090 either were arrested or deemed inadmissible at U.S. ports of entry along the border, according to Customs and Border Protection figures released Tuesday. That compares to 415,517 in fiscal year 2017, a year that saw historically low levels of illegal immigration in the months after President Donald Trump assumed office. Since fiscal 2017, however, illegal immigration has risen to levels seen during the second Obama administration. The rebound is due in large part to a stunning spike in attempted crossings by so-called “family units,” nearly all of which are from three Central American countries—Guatemala, Honduras, and El Salvador. The Border Patrol arrested 4,836 people traveling in family units along the border in October 2017, the first month of the fiscal year. By September 2018, the last month of the fiscal year, that number had shot to 16,658, the highest ever recorded in a single month. The Trump administration has attributed the surge to loopholes in immigration law that prevent the government from holding adults and their children in detention together while their cases are heard in immigration court. Administration officials say the restrictions encourage parents and other adults to bring children across the border because they know they will be released for the duration of their immigration proceedings, which can take years. The border arrest figures come as a massive caravan of at least 5,000 migrants, mostly from Honduras, is making its way northward through Mexico with the aim of reaching the U.S. border. It is the second such procession this year, after a similar group marched from Central America all the way to U.S. ports of entry in April. The Mexican government has offered to grant temporary humanitarian visas to caravan members in an effort to break up the mass of migrants into smaller groups. But the vast majority has refused to apply for asylum in Mexico, and Mexican authorities largely have allowed the migrants to continue their journey without proper documentation. Trump administration officials say the migrants’ refusal to apply for asylum in Mexico suggests the vast majority are economic migrants, meaning they don’t qualify for asylum protections under U.S. law.